Let me put on my geeky glasses as I share with you my new found knowledge about... our skin. Yep! That's right. Did you know how wrinkles are formed? It's through the course of aging as our skin loses its natural moisture and elasticity for each year that you blow out another candle. This is the reason why our moms and grandmothers would always remind us to moisturize, moisturize and moisturize from the moment you hit your mid-20s as this can somehow help slow down the aging process. Now, have you ever heard of collagen? Did you know that this plays a vital role in keeping your skin elastic and when you do have elastic skin, there is a smaller chance for wrinkles to form. Call me a late bloomer as it was only recently when I finally have a more regular skin care regimen. I grew up thinking that I will forever have soft, blemish-free, acne-free and wrinkle-free skin. After all, I rarely put on make-up and my belief was that the less chemical I put on my face, the lesser chances of having break-outs or any other skin problem. I may be right but seeing how Mommy and my Amah have such beautiful skin even in their senior years, I am not taking chances and I'm following their advice too. So, how do you bring back the collagen to your skin? There are a couple of skin care products in the market that can do the trick but being a foodie, I took the dining route first. In fact, there are a couple of collagen-rich food items such as soy, beans, olives and more that you can have on a regular basis. 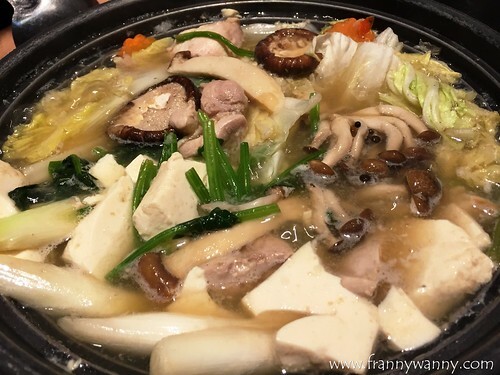 I also came across Shirokiya which is popular in serving their Health & Beauty Hot Pot with Special Chicken and Collagen Stock. If that isn't collegan-filled enough, I don't know what else is. For one Saturday night, Paul and I headed to Orchard Road for dinner. 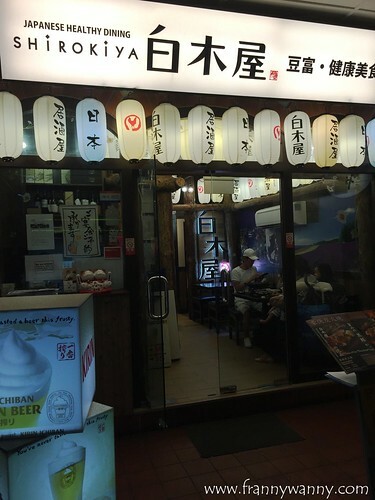 Shirokiya is located within the Cuppage Terrace complex where there are a lot of Japanese restaurant and bars. We came to know the restaurant through the Sugar App which is just so amazing! For only S$14, I was able to avail of the voucher that will entitled us to one Health & Beauty Hot Pot. Since Sugar credits are prepaid, there is a big chance that you'll walk out without having to pay a single cent. Not for me and Paul though, we couldn't resist ordering the Salmon Sushi Roll (S$10.80) which is a simple hand-roll maki filled with salmon sashimi. It was just a-okay. 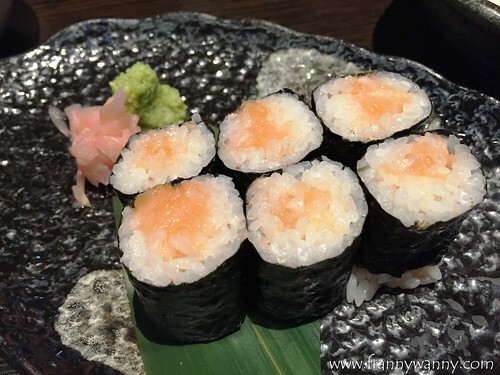 We felt that they somehow scrimped on the salmon sashimi and loaded up on the Japanese rice. 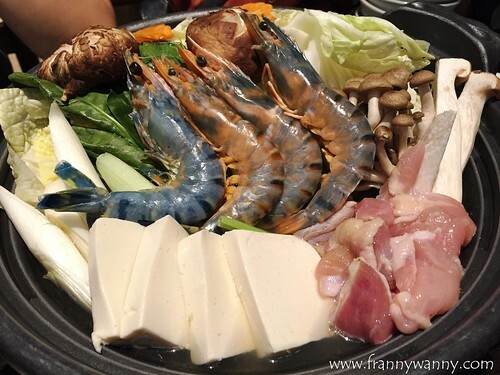 Moving on to the star of the night, this is our Health & Beauty Hot Pot (S$33.80). I was quite impressed that they really gave us the regular serving size despite purchasing the voucher for just a fraction of the original price. I commend them for that. 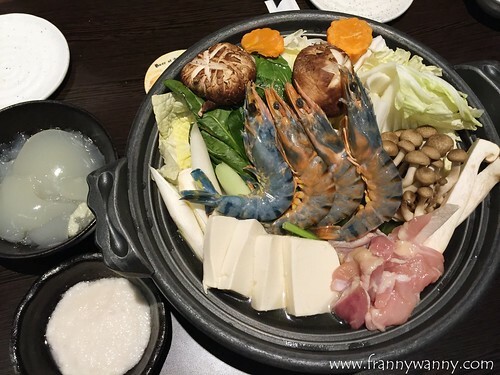 It's impressive to see that our pot was filled to the brim with prawns, chicken strips, mushrooms, tofu, veggies and glass noodles. Of course, it came with a bowl of collagen and mashed yam which our server told us not to forget to include as this bring out the flavor of the soup. Admittedly, the collagen doesn't look appetizing at all. Had it not been for its beauty benefit, it's definitely not the type of ingredient I'd put into my hot pot. They also offer free broth refills which is good as I was with the soup monster. I think we had 4-5 refills that night that at some point, the server offered to leave the extra pot of soup by our table-side. Heehee! Over-all, I think it was delicious and I liked how all the different flavors of the ingredients complemented one another. Yes, it's a bit on the pricey side but if the collagen included promises better skin and good health, then it might be worth to splurge on this once in a while. Either that or be sure to catch the next open voucher in Sugar. Check out Shirokiya Japanese Healthy Dining at Cuppage Road, #43-43A Cuppage Terrace, Singapore 229463. Make a reservation by calling them at 6732-8588. They're open daily from 5PM to 2AM.